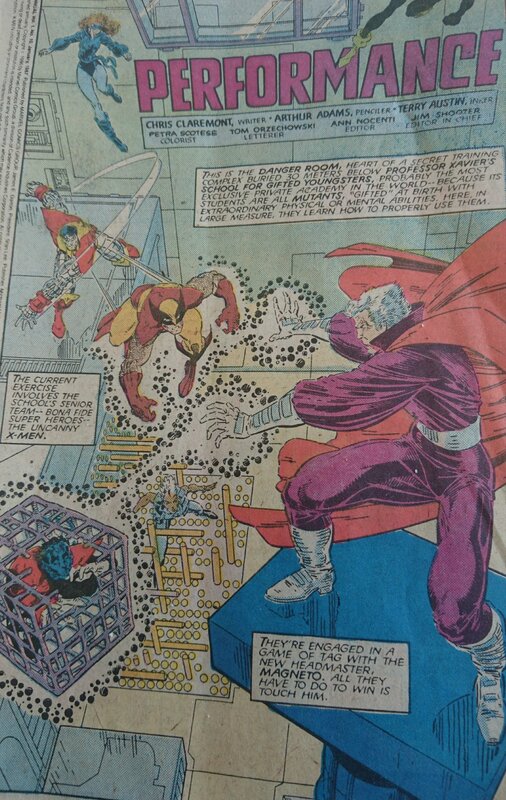 Synopsis: Performance was written by Chris Claremont with pencils by Art Adams and Terry Austin on inks and opens with a Danger Room training sequence where Rogue, Nightcrawler, Shadowcat, Colossus, Wolverine and Storm are battling the Xavier School’s headmaster Magneto, This is being observed by New Mutants members Cypher and Sunspot and current houseguest Betsy Braddock. Observing through Betsy’s prosthetic eyes is Mojo, ruler of his own universe, next to him are his aide Major Domo and another employee Spiral. The Mojoverse being obsessed with television and ruled by ratings, has lead Mojo to keep getting involved with the X-Men as they are ratings gold and sets into motion a plan to have them perform directly for him. To do so, he delivers to them another antagonist/ratings star Longshot. Longshot was a denizen of the Mojoverse, he rebelled and escaped, then went back to start a revolution, apparently he failed and with no memory has been sent to Earth, along with something glittery ‘stuff’ which overnight de-ages the X-Men after they take Longshot in. 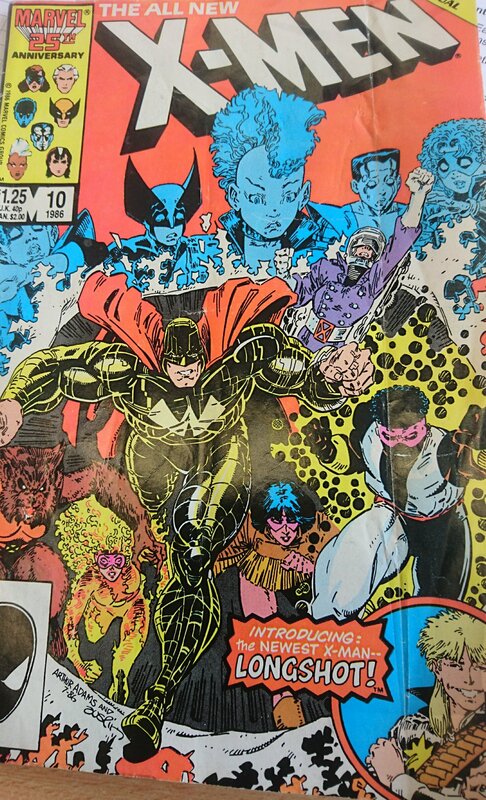 The other New Mutants (Mirage, Cannonball, Magik, Warlock, Wolfsbane and Karma) arrive with Cypher and Sunspot and notice that not only do the X-Men seem to look physically younger, but are also acting younger and younger. 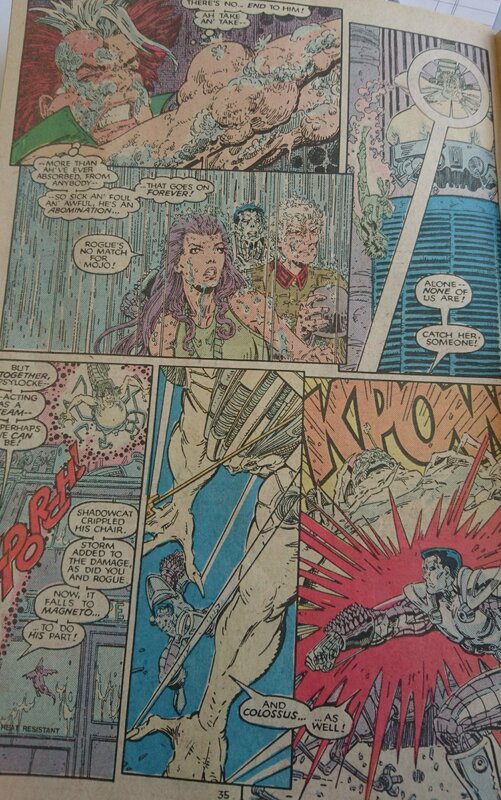 Cypher and Warlock merge and scan the Danger Room and discover the stuff that came through with Longshot is a mix of Technarchy (Warlock’s techno-organic people) technology with Mojoverse programming, confirming the villain at the heart of this to be the aforementioned Mojo. 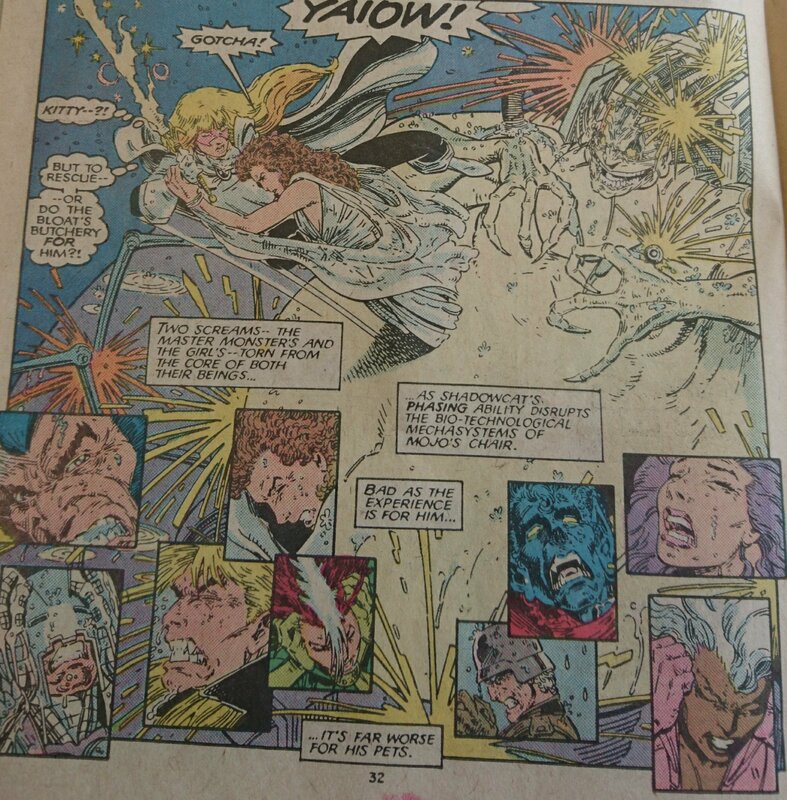 Unfortunately, Betsy reads Longshot’s mind and comes to the same conclusion and the de-aging X-Men head out after Mojo themselves in the school’s Rolls Royce, after knocking out the at this point more responsible New Mutants.. The team, becoming more X-Babies than X-Men in each minute are lured with a lightshow to a farm and fall into the clutches of the grinning Mojo, abandoning the car.. Finding it, the police contact the school to let the adults know, but with no adults there, it’s left to Mirage to take the news from the police officers. Now they know where to look the New Mutants ditch their school uniforms and dress in what are to be honest terrible graduation costumes and declaring themselves X-Men go after the runaway X-Babies to save them from Mojo. Of course it’s a trap as the X-Babies are re-aged to serve Mojo and attack the New Mutants while the whole thing is watched by both the audience of the Delacorte Theatre (which includes Thor’s frog friends and the Simonson’s, Walt and Weezie both legendary comic creators of this era) as well as the inhabitents of the Mojoverse and an inter-generational battle begins. The New Mutants show no quarter, but are outmatched against the more powerful X-Men, but bit by bit the X-Men start to remember who and what they are as Mojo descends into his usual desire for bloodshed and in the course of events, Shadowcat phases through Mojo’s equipment and the X-Men who weren’t themselves, suddenly are again. The teams combine and battle Mojo, who is beaten and then escapes. 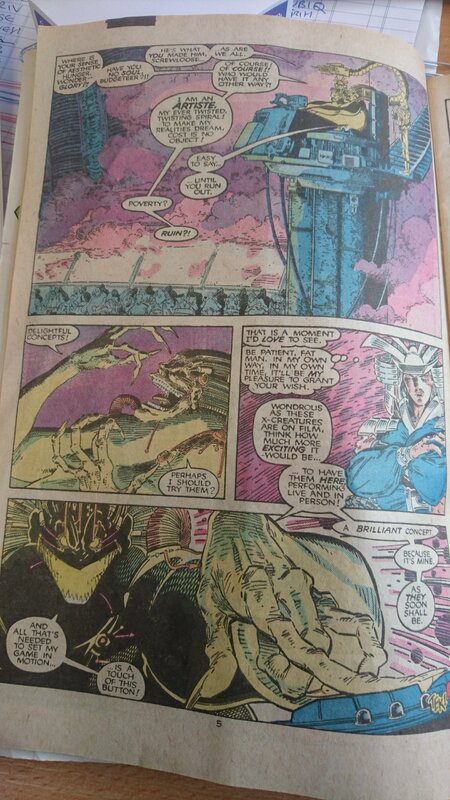 His aide, Spiral is left behind and the bloodthirsty X-Men convince her to put everything back as it was.. 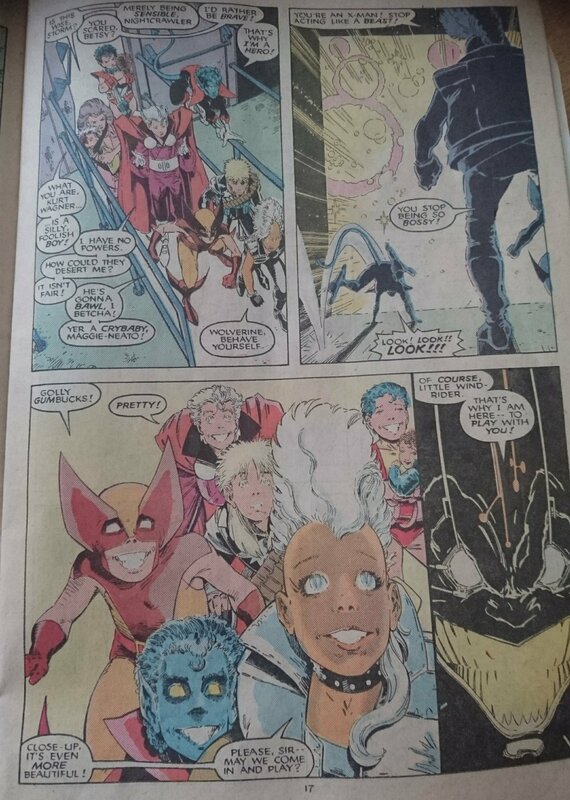 The New Mutants go back to being the junior class, aware that without them intervening, the X-Men would have remained slaves of Mojo The X-Men are as before too, Storm still without her gifts and Longshot now a resident of the mansion. 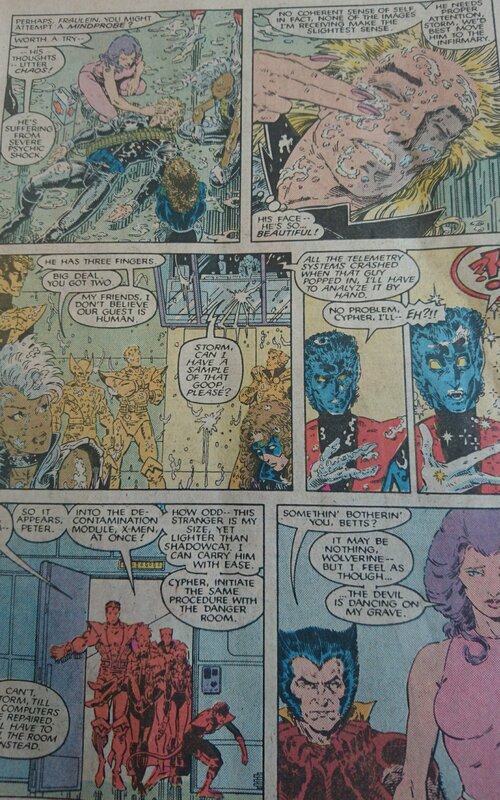 Storm, Betsy and Wolverine comment on the wills of the X-Men and how it transended what Mojo could do, while through Betsy’s eye’s the Mojoverse watches it all with glee. Major Domo comments that Mojo did really well out of the whole experience and will no doubt want to do it all again, but Mojo decides he wants to do things differently next time, but for right now, his people love him. Notes: This is bonkers. Lets just get that out of the way, it’s bonkers with a capital Bonk. So lets have a look at it all. The introduction of Longshot was an effort to make use of the character after his proposed Ann Nocenti written series was shelved. This way you get to use Mojo, Spiral and Major Domo as recurring X-Villains as well as prevent a writer less in tune with Nocenti chance to screw up Longshot, who’s gimmick of amazing good luck if his motives are pure is a story making machine if used correctly. This isn’t exactly the same character as before, but you can tell Claremont has ideas already. 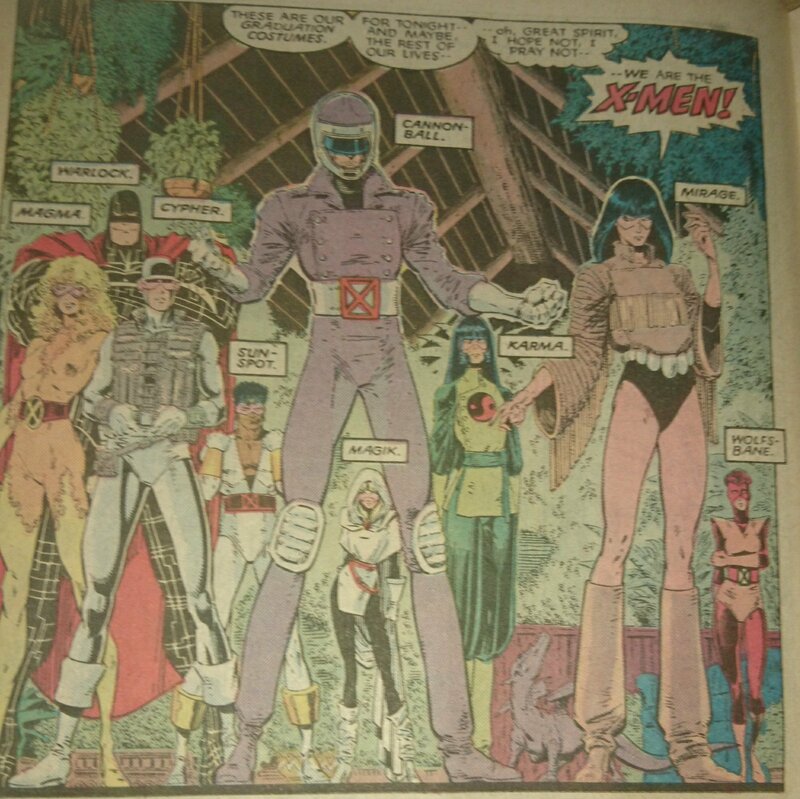 Much of the annual is a New Mutants story, with their status as perpetual understudies highlighted to great effect. Them being the ones to head out to save the day was a nice touch as was them discovering Mojo’s involvement independently of the X-Men makes them the heroes as much as the main characters. This annual is also the first time we get X-Babies, an idea that will of course come back again and again. Their contrast against the horrific Mojo works nicely, given how cartoony Mojo can be. They are a lot of fun and you can track Scottie Young’s style to here with ease. 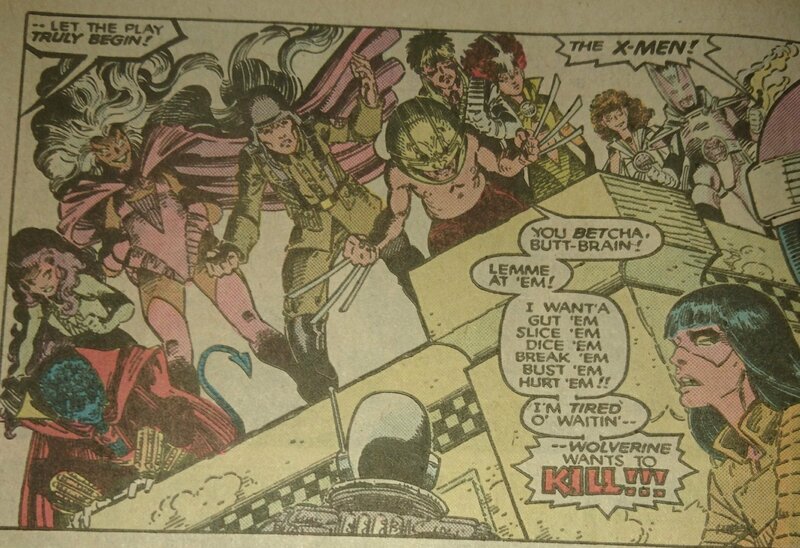 Ordinarily with X-Men comics of this vintage, the quality is mostly in the writing. 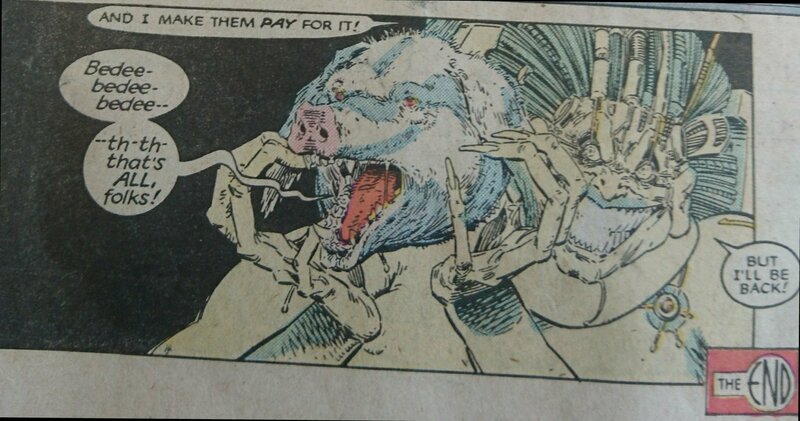 But X-Men also has a fantastic art pedigree. 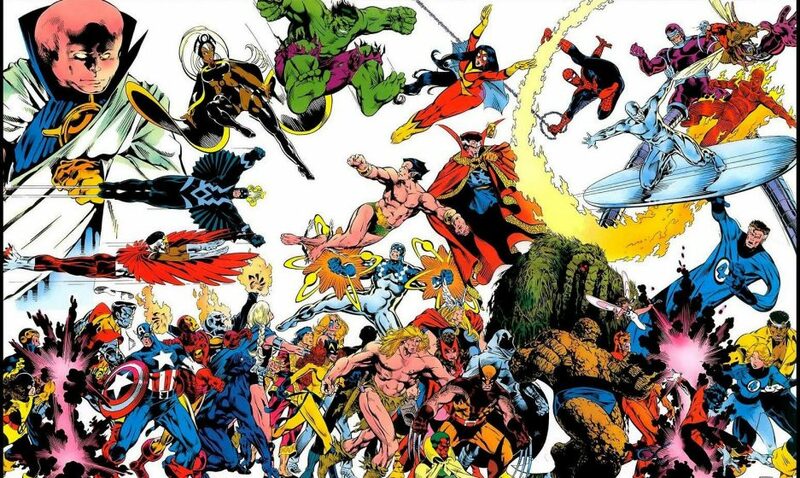 From the King himself, to Nepal Adams, Dave Cockrum, John Byrne and Paul Smith, it’s been a who’s who of iconic artists. 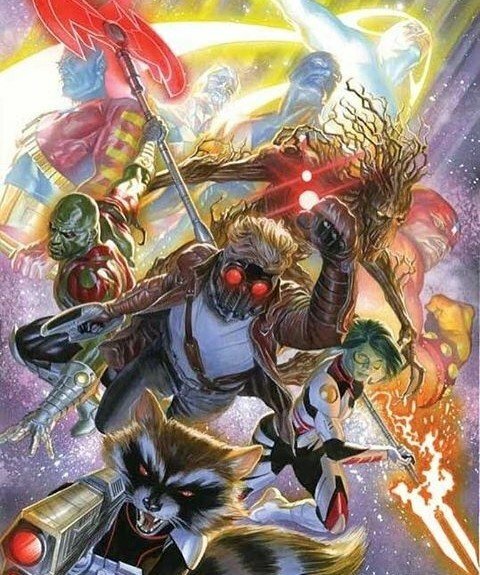 Art Adams deserves to be on that list too. No one does Mojo as well as Adams, the cartoon nature mixed with horror and fantastic character design. Seriously though, everyone in the cast has fantastic hair. All big all 80’s and all fabulous. So while the story is less than spectacular, the art by a guy called Art is phenomenal. And just when I think that I have enjoyed all I can, we get a horrifying Looney Tunes riff at the end. Next Time: Daredevil gets dark as a serial killers starts his spree.